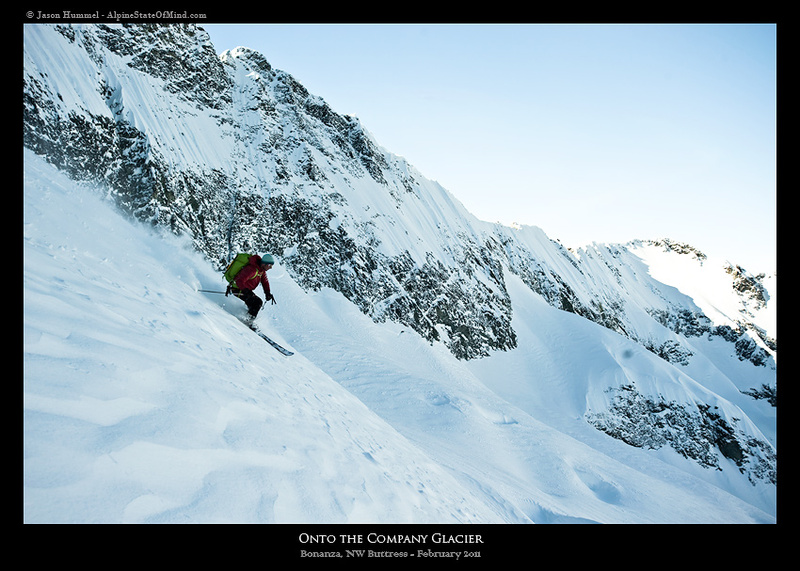 When climbing and skiing Bonanza, I had phrases like, "We're in such good company" for the Company Glacier that lies below our intended route, the NW Buttress. 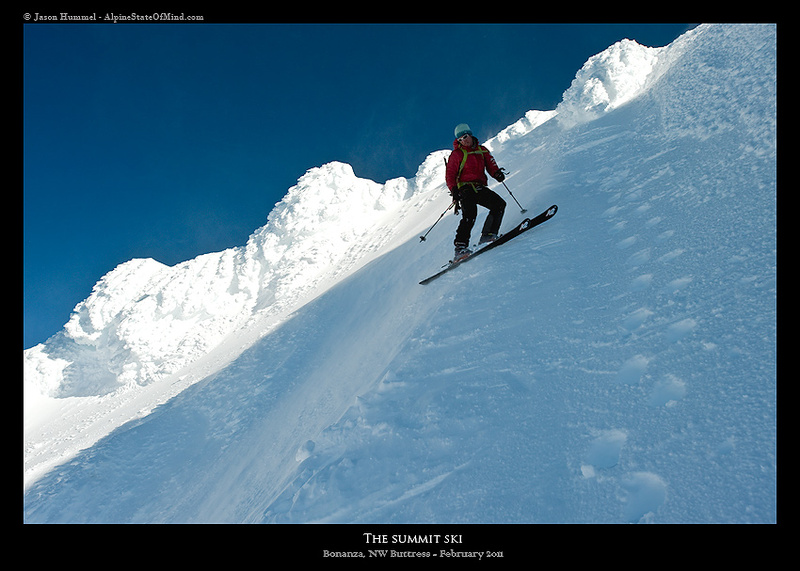 Of course the obvious, "What a BONANZA," for the great weather and conditions we would enjoy. My emotions would be torn throughout the trip, though. 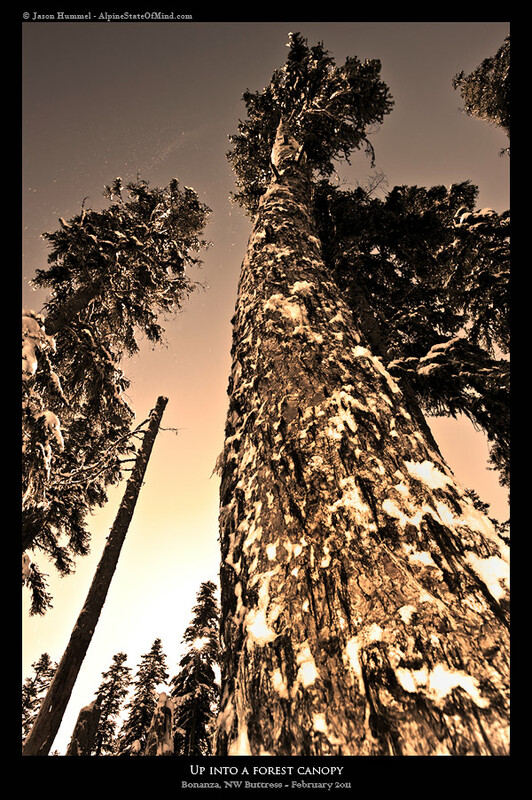 In the past I had my closest friend pass away in Olympic National Park, a few acquaintances elsewhere in years since and just this past week, Monika Johnson. 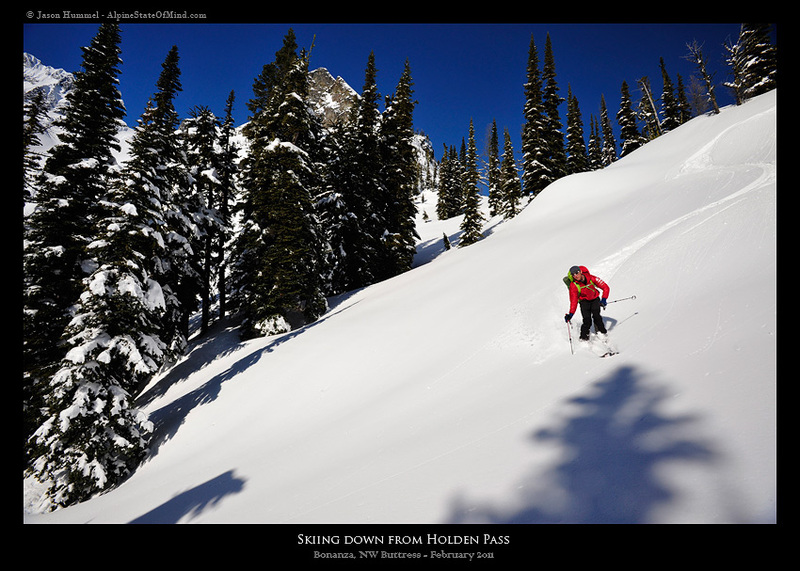 While I had only skied with her a handful of times, she was tied into a close knit family of backcountry skiers throughout the Northwest. Her strength, determination and will power were legendary! 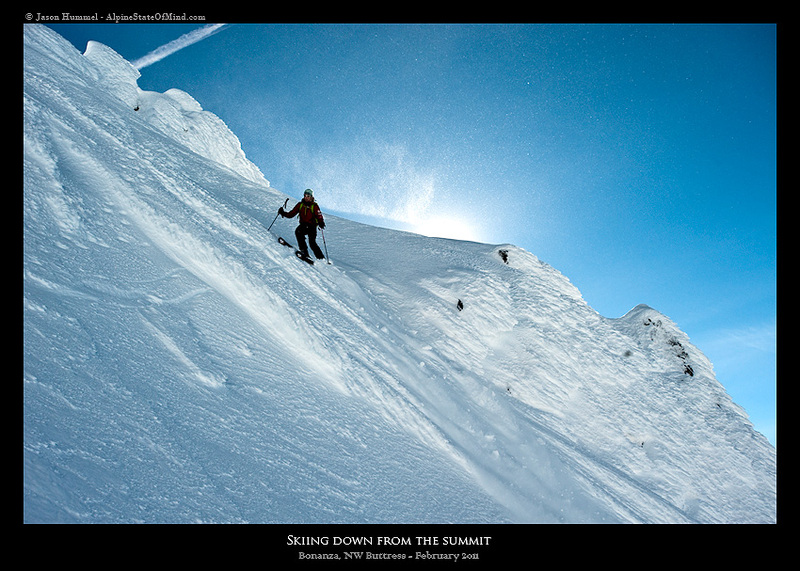 It wasn't a surprise to any of us then that she was skiing in the Snoqualmie backcountry in early February, alone. What was a surprise was that she wouldn't be coming back. 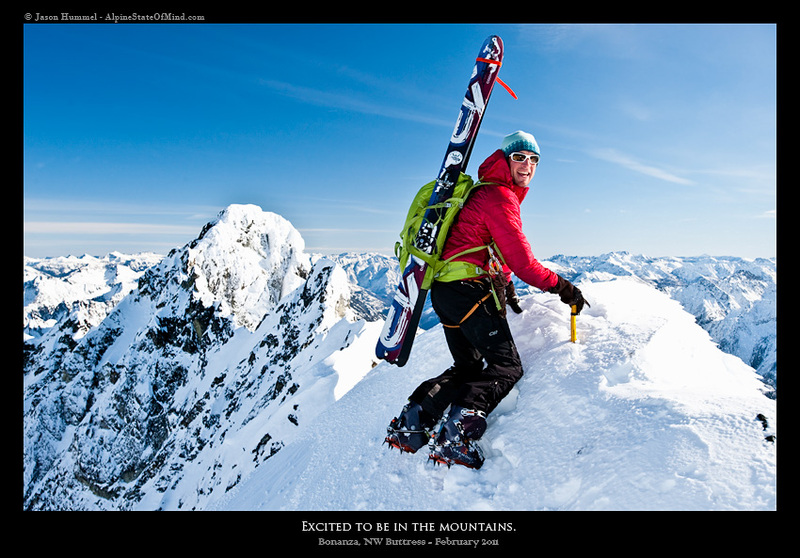 A picture of her skis, pack and helmet taken by a helicopter news crew at the summit of Red Mountain leaves me heartbroken every time I think about it. "Where is the owner," I'm forced to ponder? The answer is gut-wrenching. In the background steps lead to an edge where a cornice had collapsed. 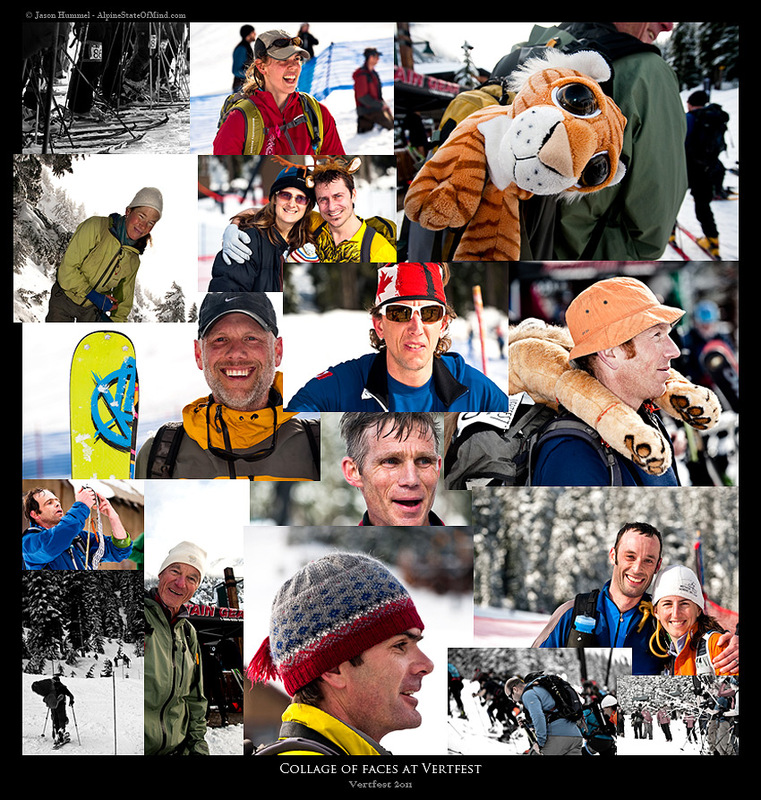 Remembering Monika and celebrating her life came on February 13th at Vertfest after my climb of Bonanza. This is a local randonee rally at Alpental (near Snoqualmie Pass). 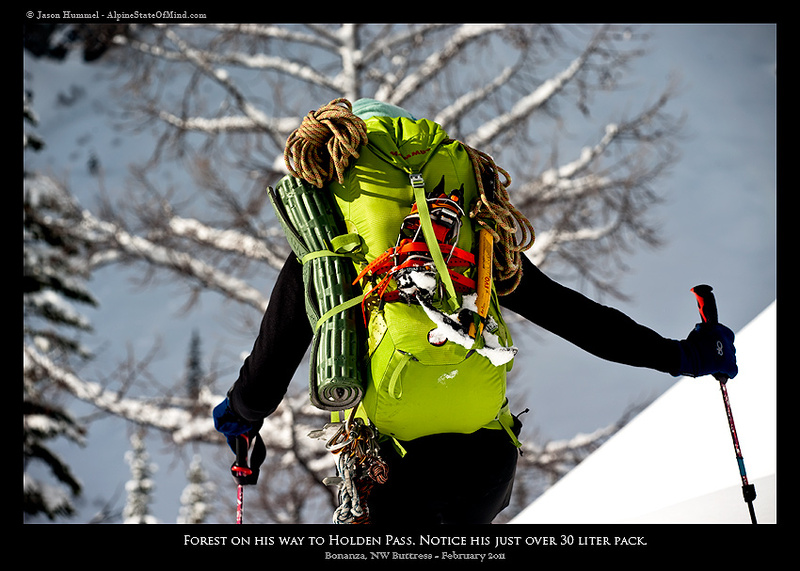 Many of the 120+ skiers would carry a stuffed animal strapped to the outside of their packs just as Monika had as a tribute to a close friend of hers who had perished in an avalanche. Seeing the same being done for her was a very moving tribute. So was the foot stomping, ski pole tapping and screaming by all participants throughout the event. This outpouring of emotion was a stark reminder of how we are all connected, affected and moved by those people that are among the best of us, especially by those that make room in their lifetime to give back to others. The love shown at this event was a testament to how she lived her life, "...with a smile" that was most definitely open and giving to everyone around her. We'll miss you Monika and as usual you are breaking trail for the rest of us. RIP. As I had hoped, going to Bonanza was quite the healing experience. Not because Holden village is owned and operated by the Lutheran Church, but because the overly religious air that I had expected to find was far from the truth. No one was trying to save my soul. Instead what I found was a cross-section of people from all walks of life who were genuinely happy to have us. By the end of my short stay, I would leave with a smile. Getting to Holden Village requires a long boat ride up Lake Chelan. At 1486-ft, it's the third deepest fresh water lake in the United States. Because of the mountains that rise above it and its length, no roads have ever been built from beginning to end. As a result, a boat called the Lady of the Lake takes you from one end to the other. The Lady of the Lake only runs three days a week in the winter: Monday, Wednesday and Friday - so plan accordingly and take a warm coat. It is great to sit on the deck and watch the snow-capped mountains roll by. We arrived in two separate cars at Fields Point where the boat takes off. There were four of us: Tom Murphy, Forest McBrian, Kyle Miller and me. In the second car, Tom and Forest would arrive by the skin of their teeth a half an hour after Kyle and me. They would tell us their tale later. It went like this - when driving past the town of Chelan, they watched the Lady of the Lake set off for Fields Point ahead of them. With the race on they pushed Tom's old truck to its limit wondering all along, would they literally 'miss the boat'? With seconds to spare they arrived, came to a screeching halt, jumped out and quickly opened the tailgate, whence a flood of gear was pulled from the back and packed in a rush. At the same time a parking pass ($6 per day) and boat fare ($39.00) was purchased before they rushed onto the dock where Kyle and I were waiting for them. 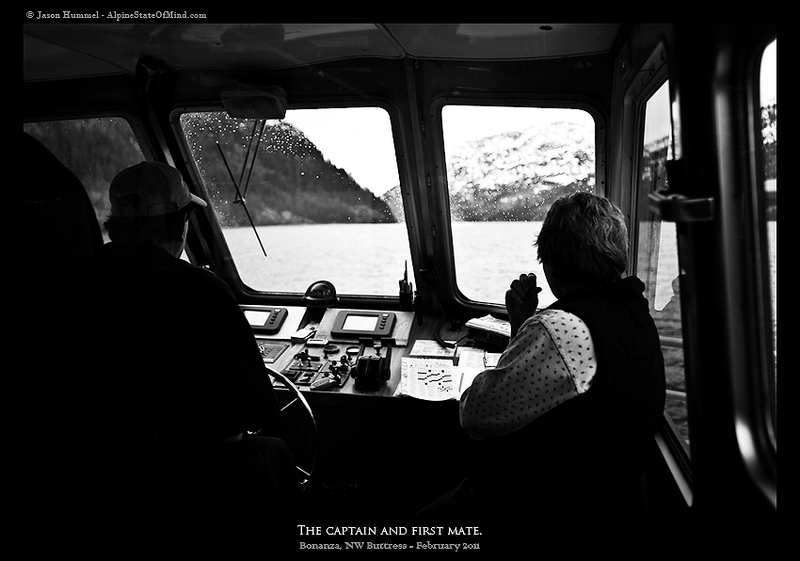 Once boarded, the relaxation on the boat managed to calm nerves...at which point we heard their story. A few hours later we pulled into Lucerne next to a dock and proceeded to help unload the boat of supplies, anything from eggs to our ski gear. 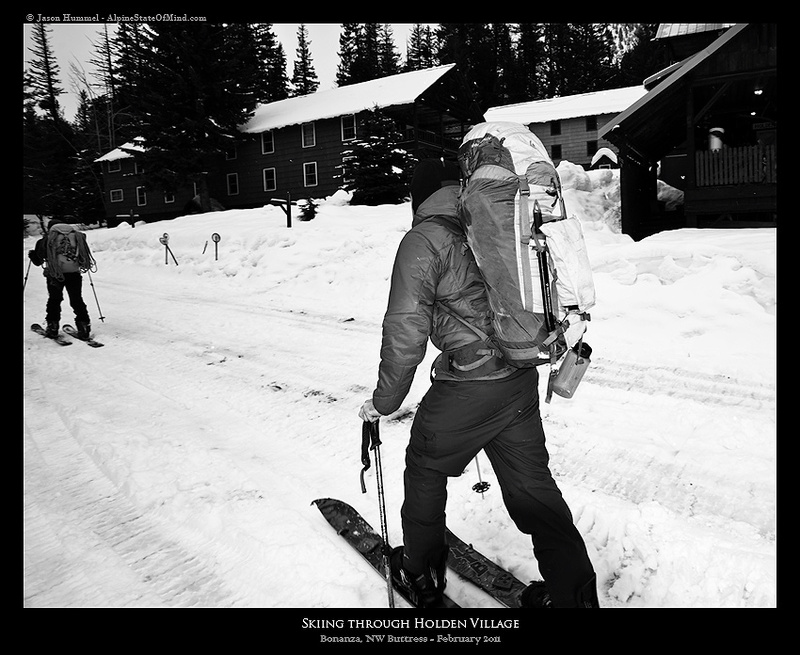 All of the food was bound for Holden Village. There was an incredible amount of it. We stacked everything we could into the van. For lack of room, our group stayed behind and waited for the next bus, which would come a few hours later. This set us back, but we were fine with it. When you let life get in a hurry, you forget to take in the moment. It was 3p.m. by the time we arrived in Holden Village. A group waved at us as we unloaded. Since we'd been on the move since 5a.m. it was nice to have finally arrived. 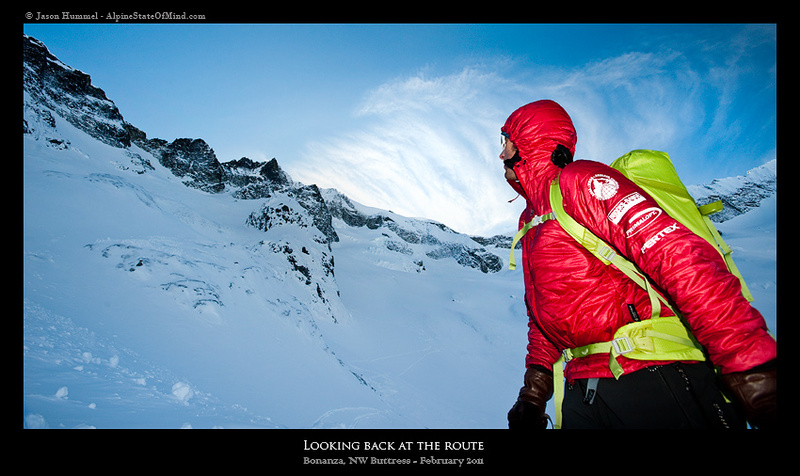 After a bite to eat in the town’s cafeteria, we heaved our packs on and skied straight up main street into the forest. Like when I was in Peru hiking through the remote towns in the Cordillera Huayhuash, I felt like I'd been to somewhere special and different. Only in time would I recognize exactly what that was. 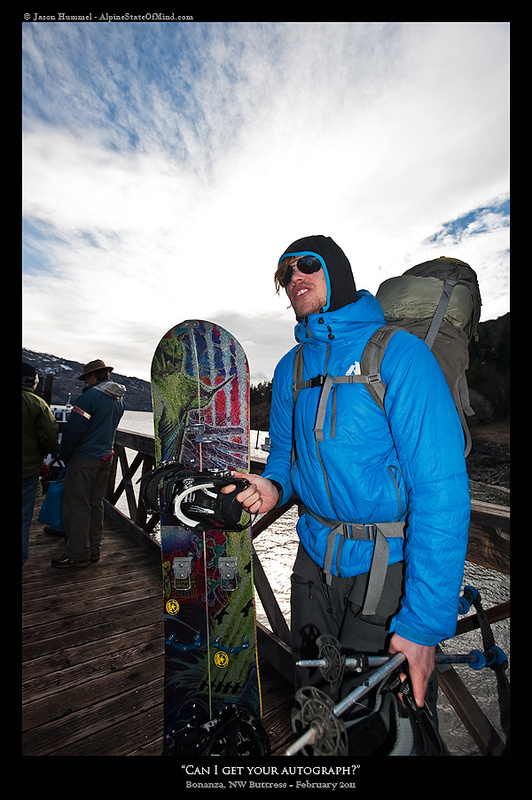 No more than a mile out of town Kyle's binding broke on his splitboard, but only the tour mode, not his downhill mode. Tom and I, concerned that no one was following us, returned to see Kyle crouched over his board. Dismay was written all over his face. It was decided that we would return to town and borrow a set of snowshoes and make camp near town. At 5a.m. we awoke to a new morning. It was cold and partly sunny. After an hour getting ready, we proceeded up the trail until we lost it in thickets of brush. Sloppy snow over an icy base made for troublesome travel, especially when most of it was side hilling. 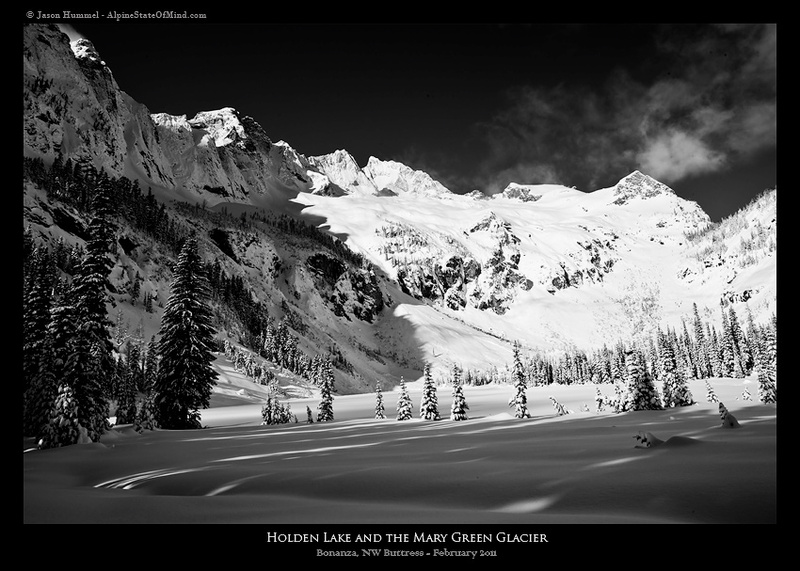 By the time we reached Holden Lake basin, Kyle and Tom both decided to turn around. Kyle with his broken binding knew his having to walk or snowshoe would take up valuable time and Tom had a bad infection on his toe from playing soccer earlier in the week. He'd end up taking antibiotics and getting a bad fever. Before we knew it, Forest and I were alone. 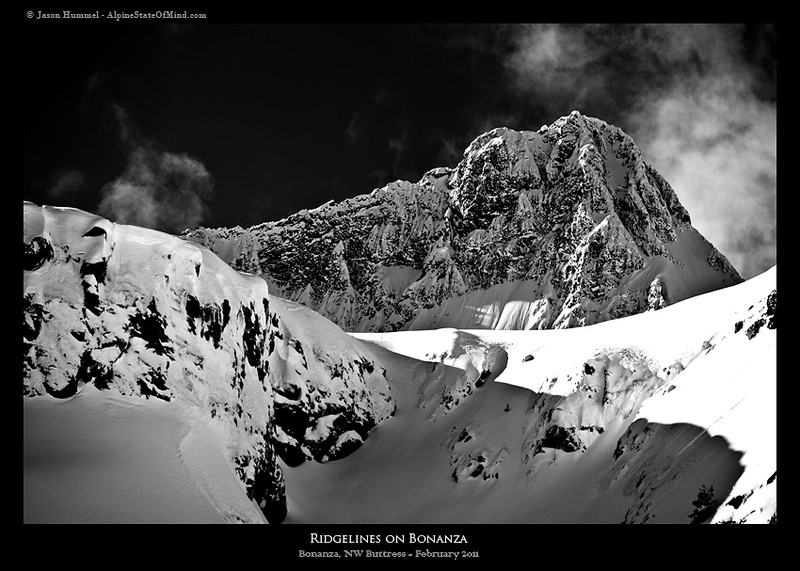 It wasn't long before we began to climb into the alpine where rocky ramparts dropped from both Bonanza on the left and Martin Peak on the right. Each presented views that improved the higher we rose. At Holden Pass, Forest and I looked around and we could think of no reason to continue. 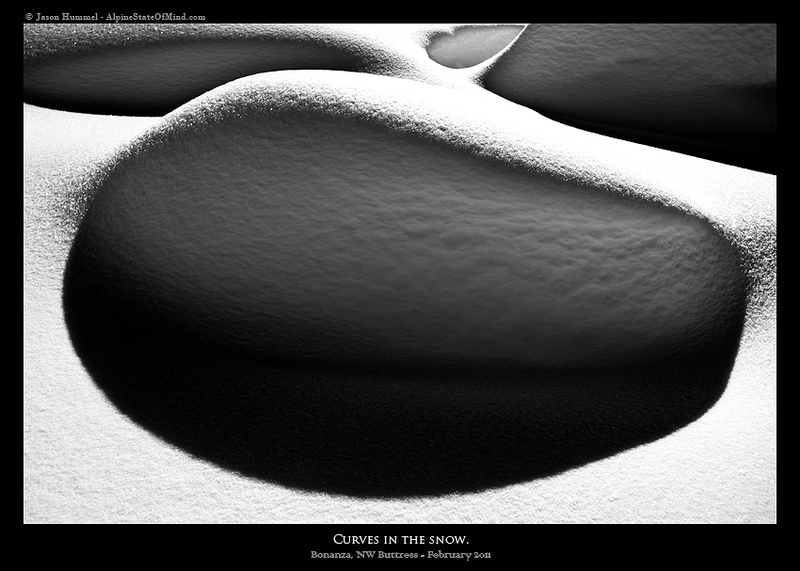 It would take a few hours to dig a proper snow cave and get comfortable anyhow. Plus it would be a very cold night ahead. The better the cave was, the warmer we'd be. Stars peeked from outside our cave's tiny entrance. The expected clear weather window we had come all this way to enjoy was in fact here. 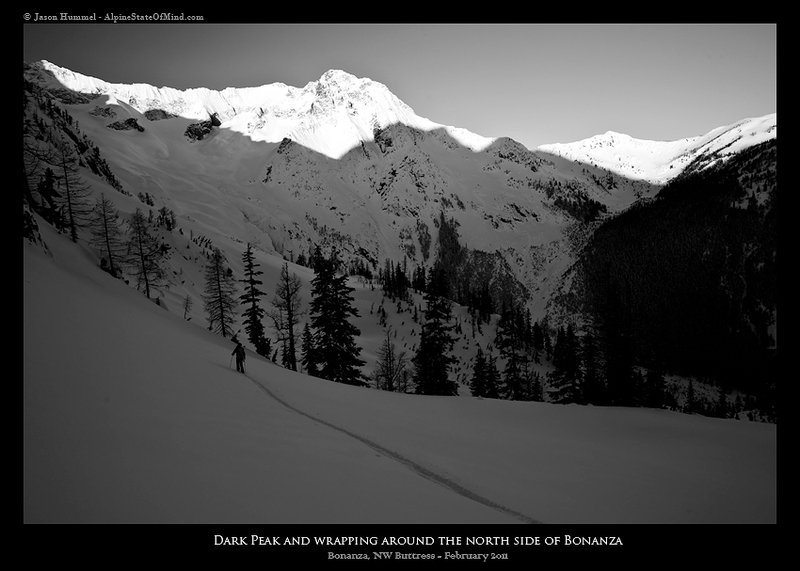 Ripping our skins, we descended several hundred feet into a small valley by headlamp before climbing the opposite side. 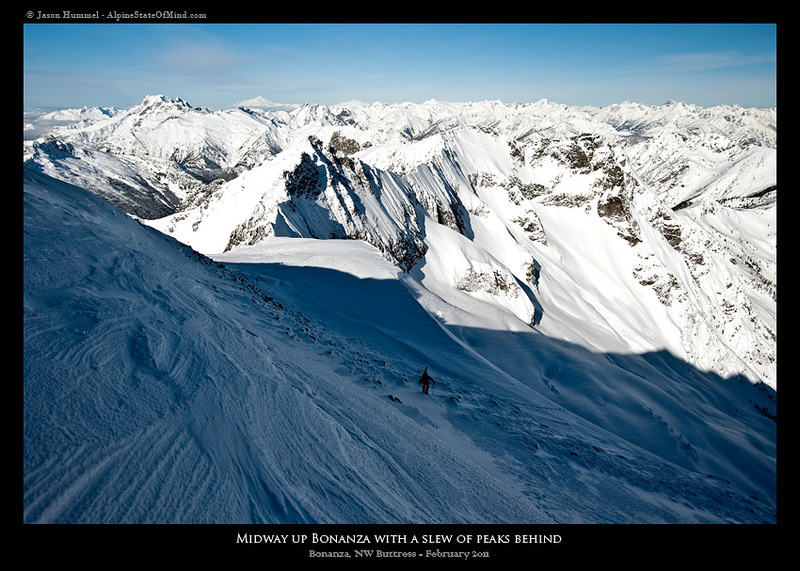 Our goal was to traverse to the north aspect of Bonanza. 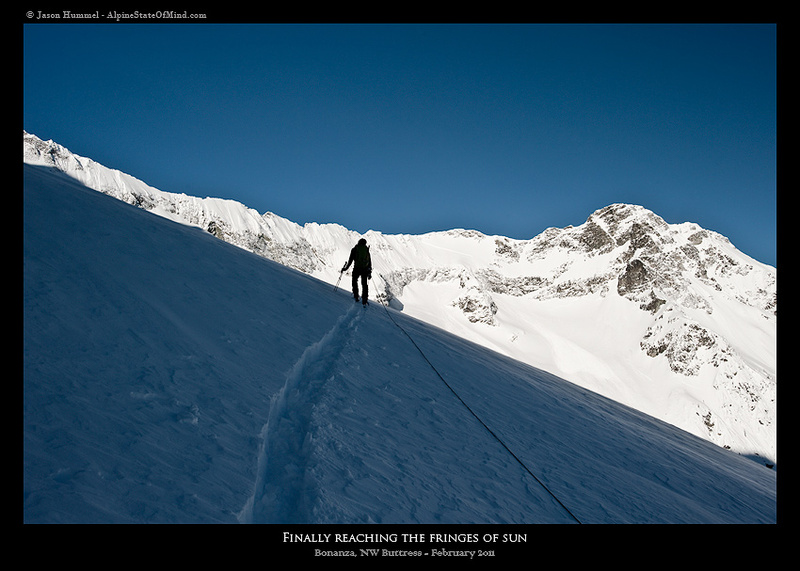 Only part way there, light began to grace the peaks around us. 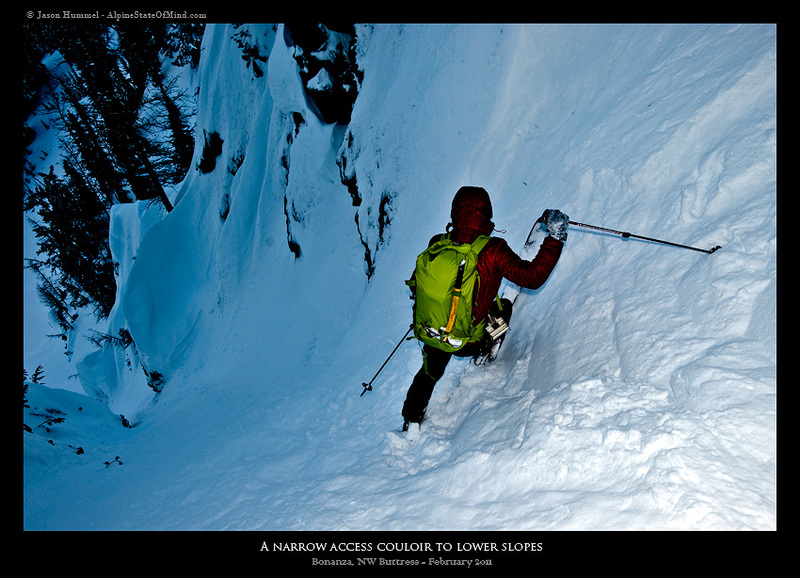 While I was enjoying the view, Forest noticed a steep couloir. I convinced him to descend it by saying, "You have to take advantage of the little things along the way because they may be all you get". 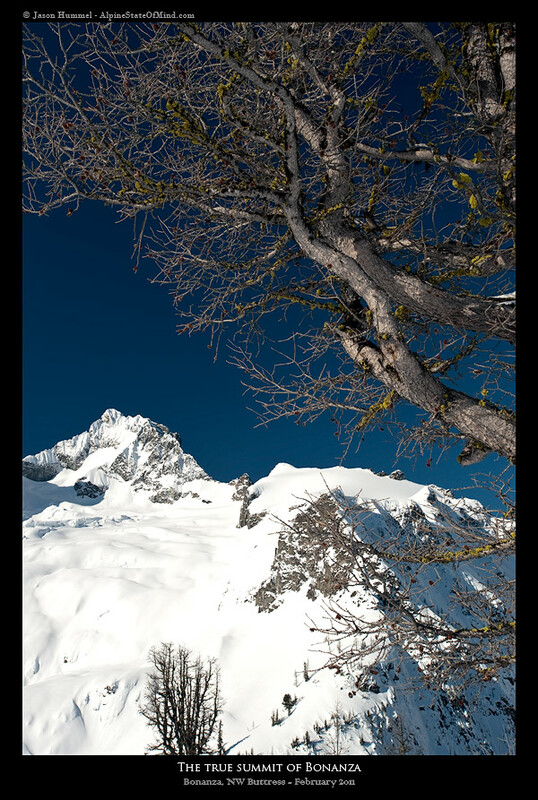 Steep turns led to nice field full of half-covered avalanche debris. They were like land mines or sharks, ready to reach up and get you. I was warned by Forest with a holler from below. Even so, I felt my leg crash into one and take me down. Who needs coffee in the morning when you can have cold snow on the face and down the back of the neck? On the Company Glacier with our high traverse behind us, we looked back, happy to have avoided all the cliffs. Ahead, Dark Peak protruded. On the left of it rose our NW Buttress. 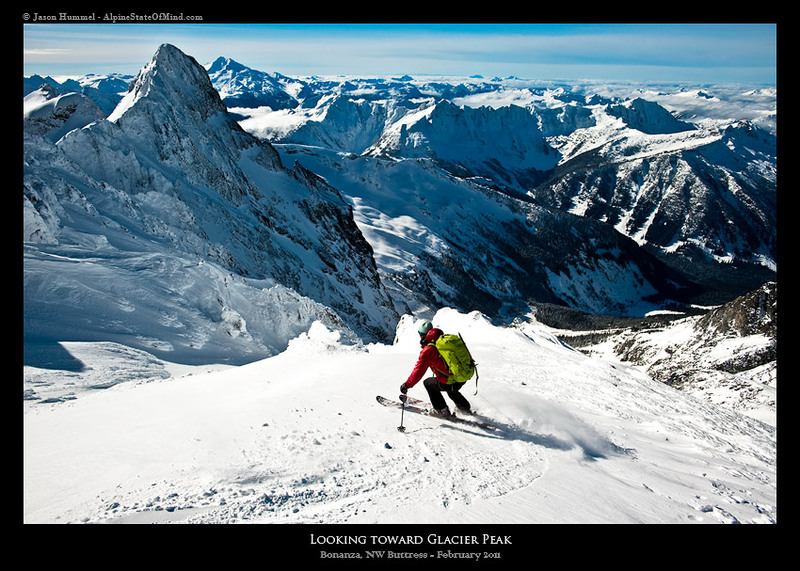 At its top was the West Peak of Bonanza. 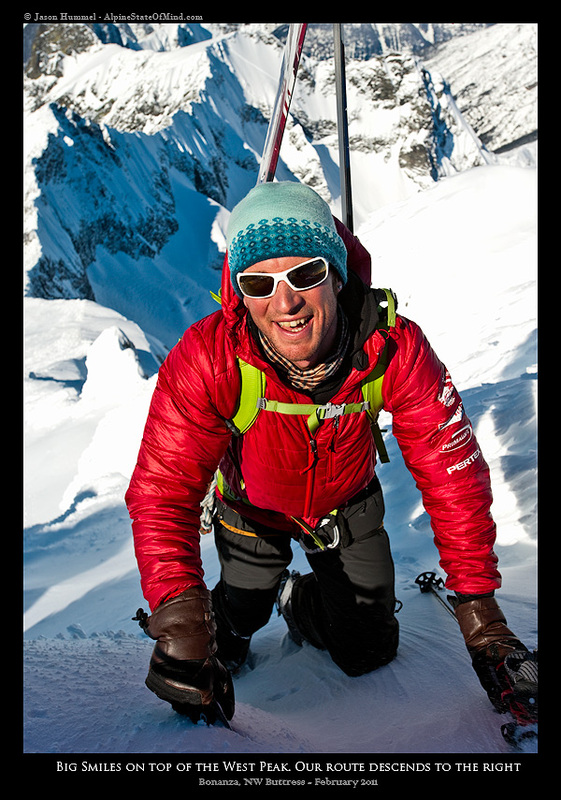 While I was gawking at my surroundings, Forest pulled out a probe to measure the snow depth on the Glacier. Earlier the day before he had taken many measurements such as snow temperature, air temperature, etc. and written it down in his journal. It's nice to have a guy along who pays so much attention to what's going on. Before we continued, we tied into a 30 meter rope we had brought. 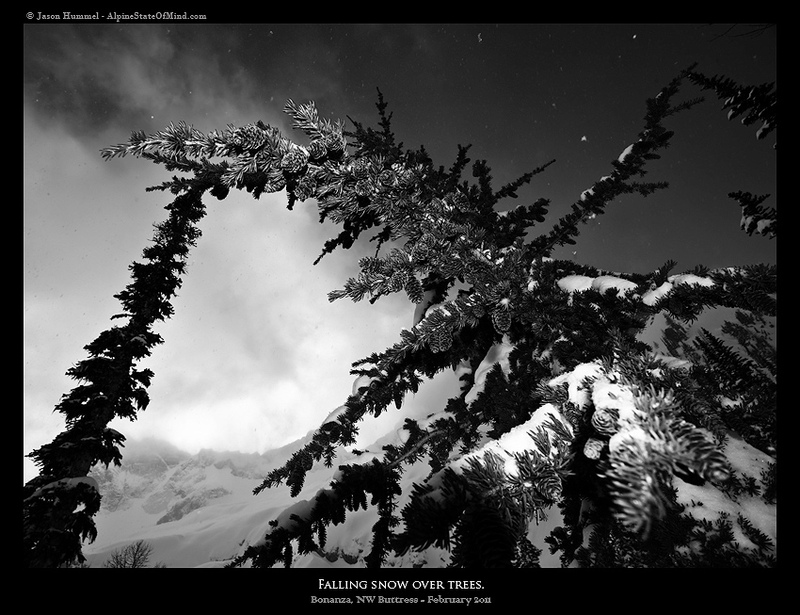 Low snow pack makes it wise, especially so early in the winter. 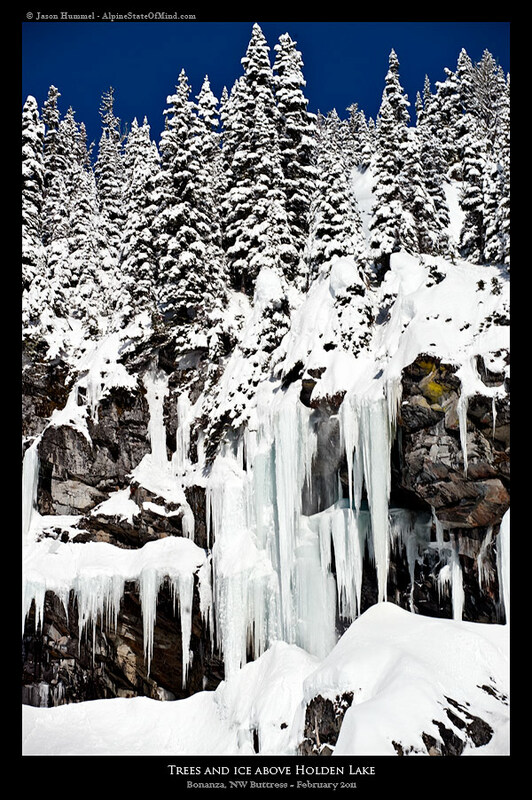 The maximum snow in the Cascades isn't until April or May, depending on the altitude. However this glacier wasn't too broken up, and the few visible crevasses were easy to avoid. 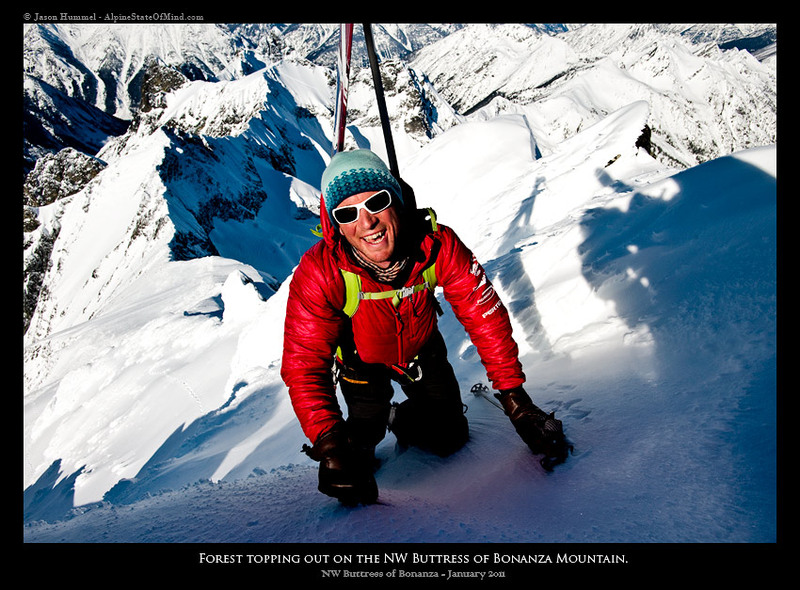 Rounding a corner below cliffs, Forest and I gazed directly up the NW Buttress of Bonanza. 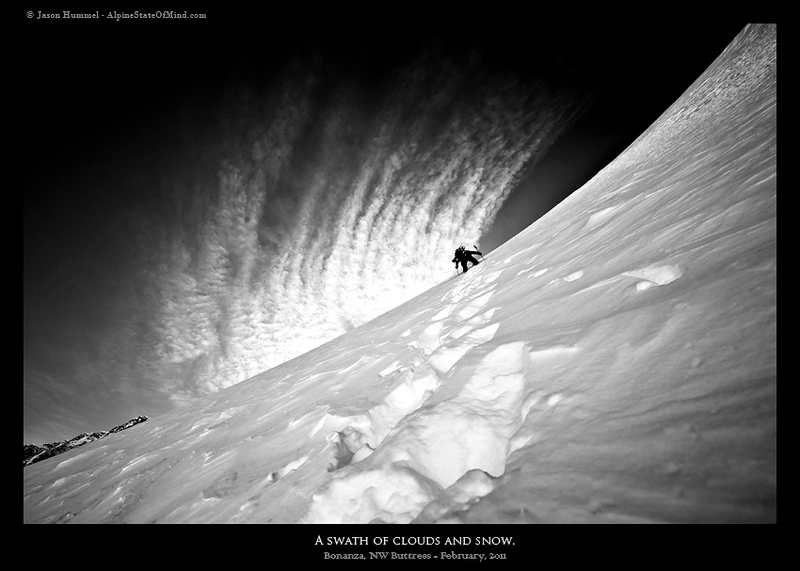 Glinting snow was seen being tossed off its west summit. 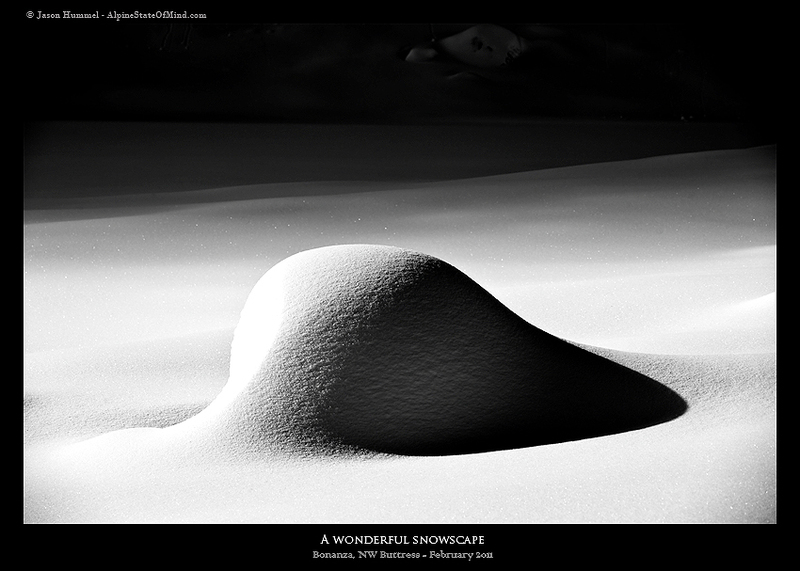 All along we worried about snow stability, especially on the colder northern faces. The wind didn't alleviate our concerns. 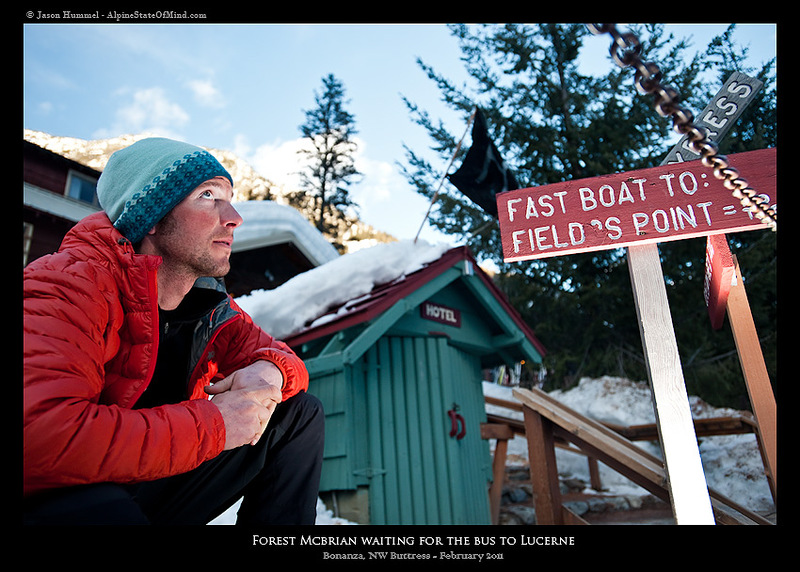 After storing the rope and skis, Forest took the lead up boot-top snow, which in places became icy, but we determined was safe to continue up. The NW Buttress has a roll at its midpoint. On icy rocks we took a rest. 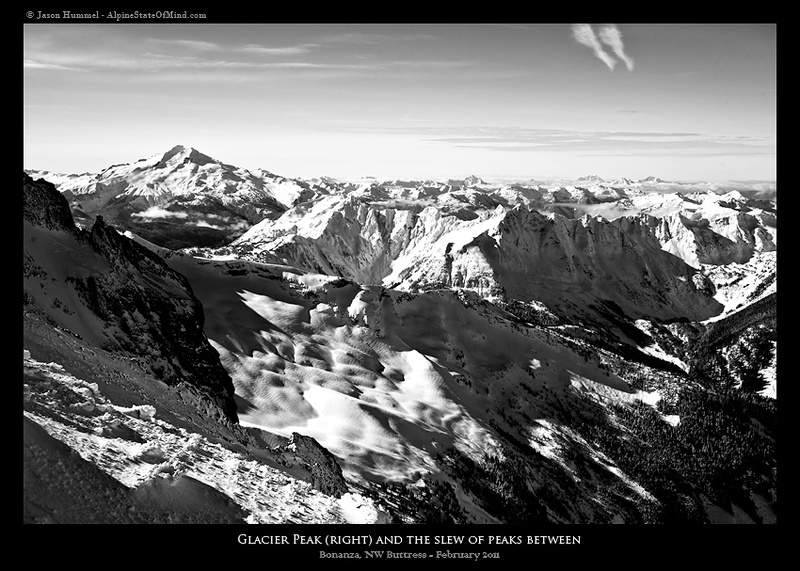 Glacier Peak held my attention. 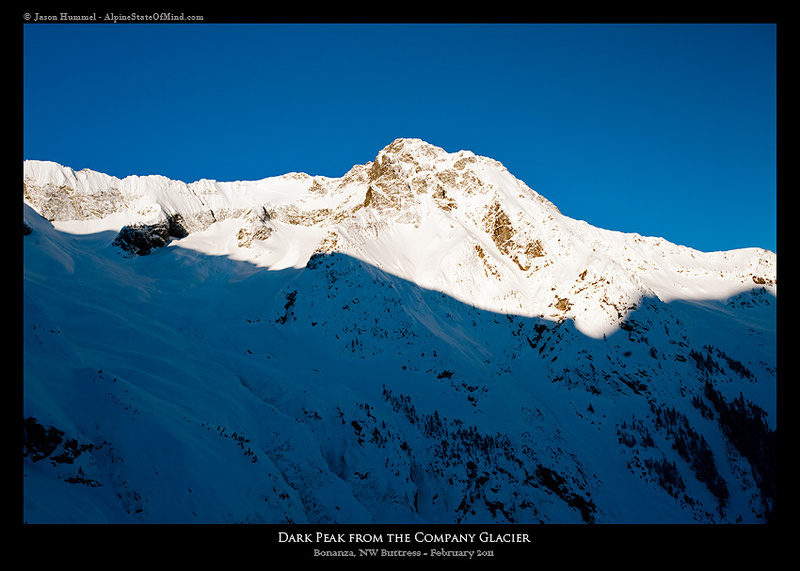 Dome Peak, too. Before we got cold, we started moving. 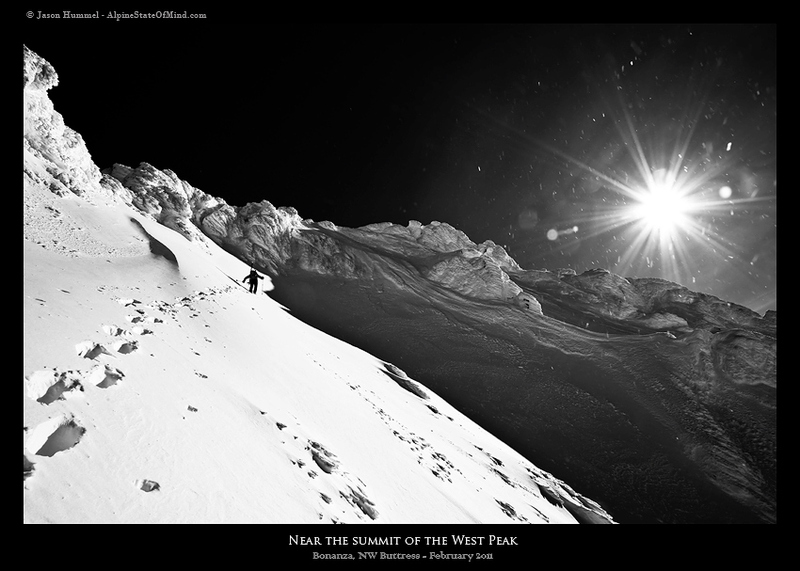 I took the lead beyond a rock nose, finally attaining a wind-scoured ridge where sculpted fins of snow stood one to three feet high. 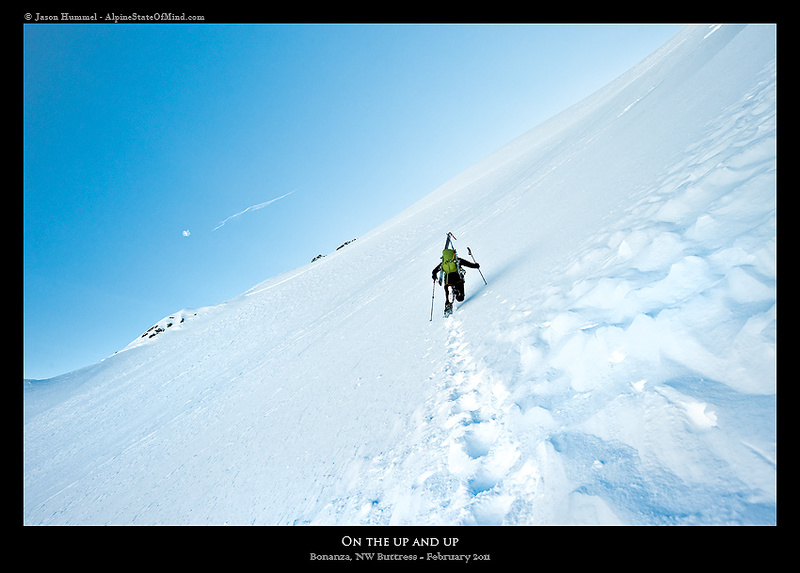 Below the final hundred feet to the top, we came to a steep face; it was icy and marginally skiable. At first I thought that it wouldn't go, but a closer look showed that it wasn't as bad as it had first appeared. Forest took the lead to within ten feet of the top and I led to the summit ridge and across the traverse to the West Peak. Wow! Glory, glory - what a view - what a heart-knocking view. 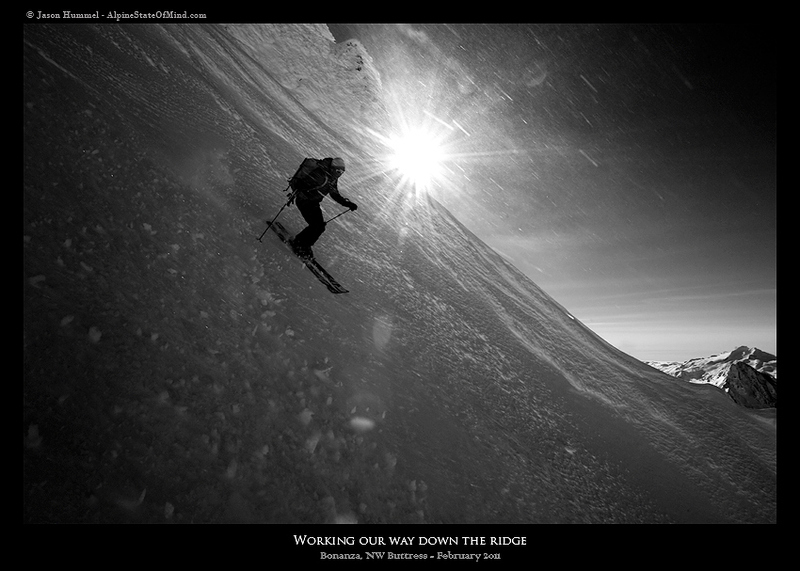 Switching to downhill mode is always a challenge in a place like this. I remembered telling Forest, "Man, this is like standing on the roof of a skyscraper. 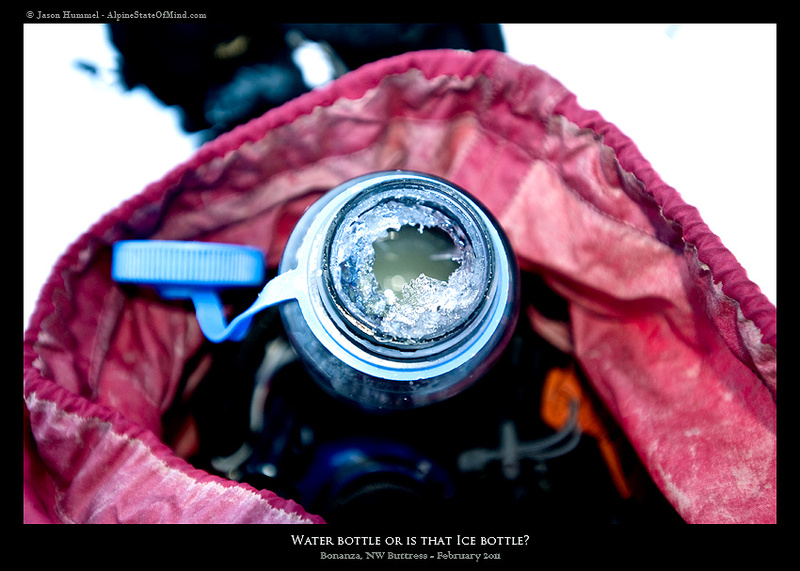 But add ice and wind, and then try to put your skis on without slipping over the edge". It's not that bad, but thinking too much about the precarious nature of it can mess with your head if you let it. 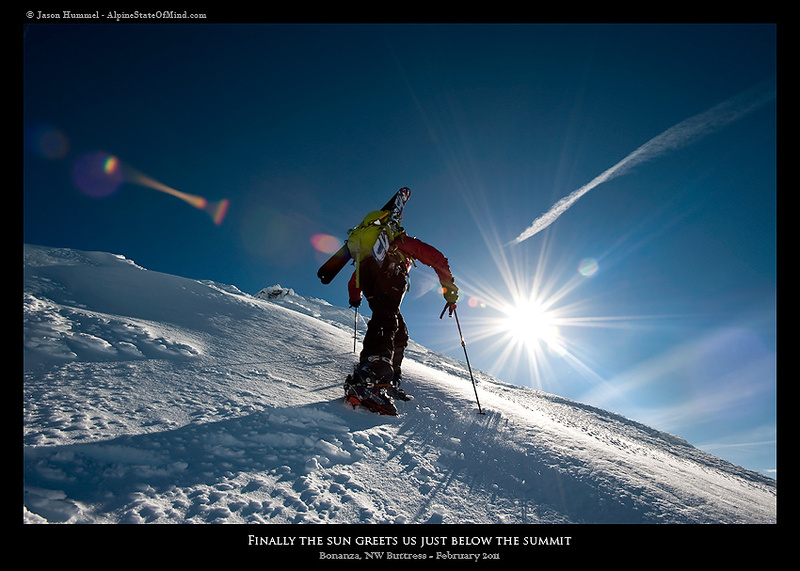 Finally the tips of my skis were pointed downhill. 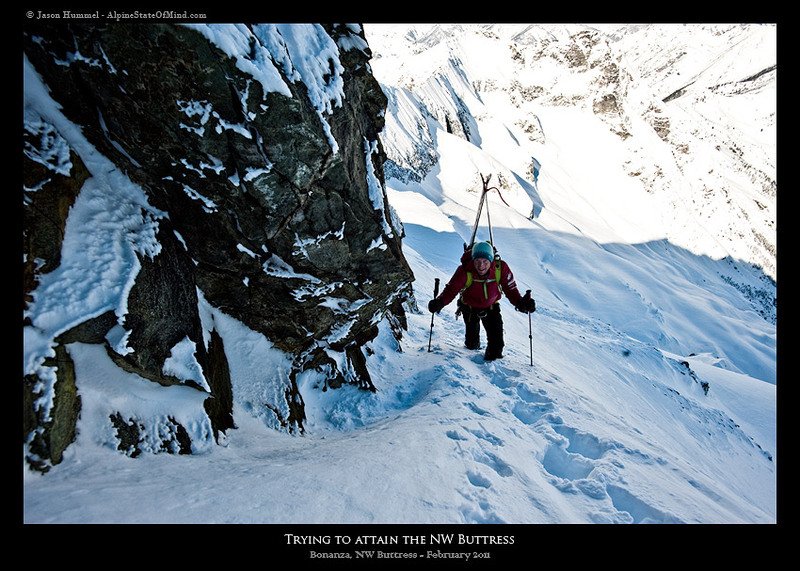 Almost 6 years ago, in 2005 I missed a chance to join Sky Sjue, Dave Coleman, Phil Fortier and Paul Belitz when they skied the NW Buttress in late spring. Their adventure was the inspiration for this one. Those guys killed it and it's been awesome to return. 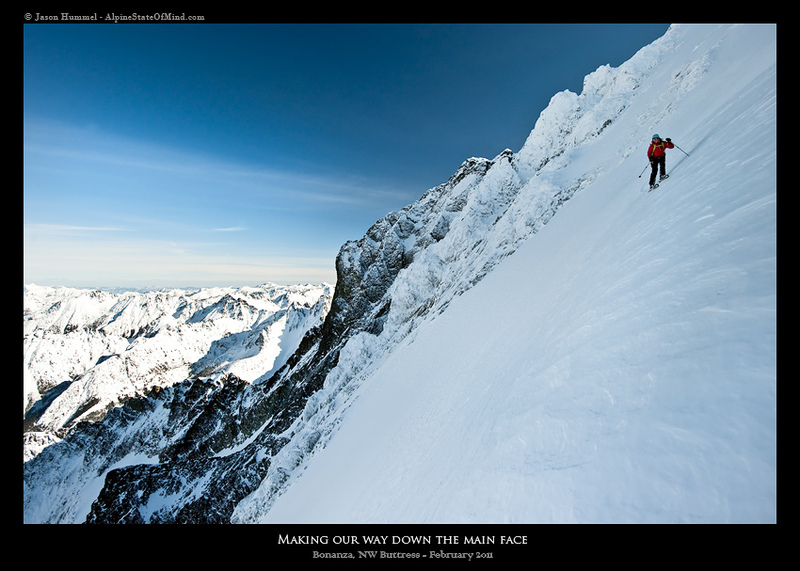 It’s so amazing to look down this spectacular face, at all the peaks in their winter coats and feel the edges of my skis slice into those first turns. We ended up skirting the face since we were wary of wind slab. Several test turns indicated that things were solid. 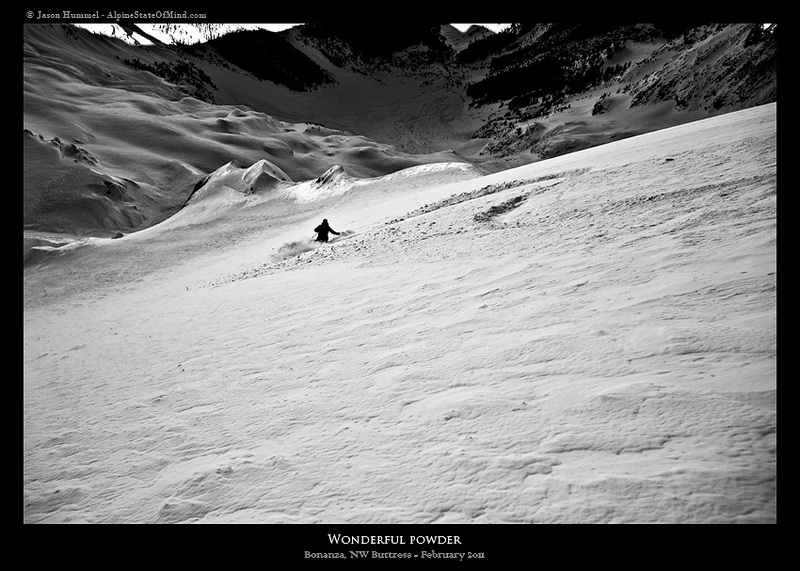 Below the first roll we were greeted with powder throughout, casting all worries aside. I had begun to feel a smile spread over my face, getting bigger with each turn. 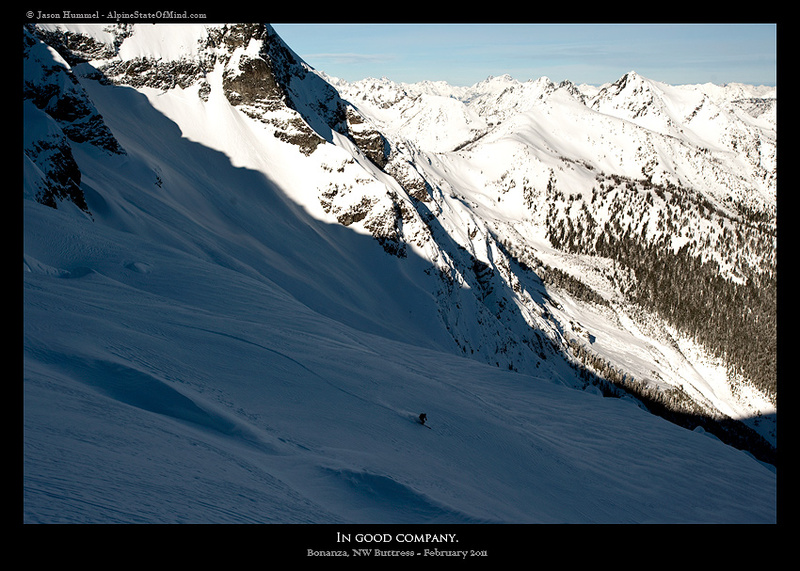 It was worth all our efforts for this taste of winter skiing in such a wild and remote corner of the Cascades. Each turn was a shot-of-awesomeness. It felt like it lasted forever, but it really didn't. 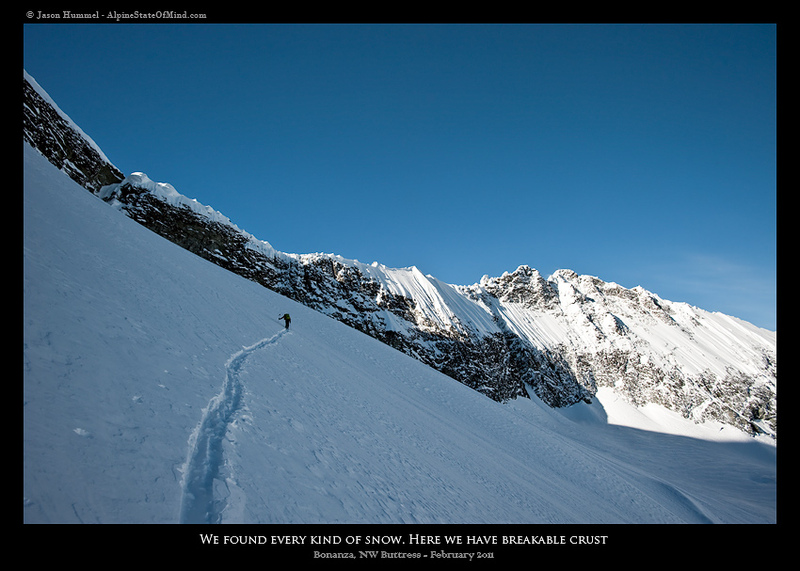 Far too soon, but never soon enough, we were off dangerous slopes and back onto the Company Glacier. From there, staring back over his shoulder, Forest contemplated our day’s good company and what a bonanza it was for us to be here at all. 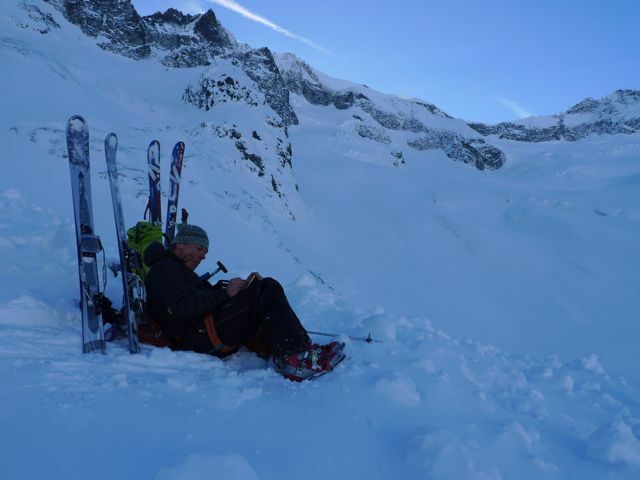 Since you must always take advantage of the moments you have in life and not rush them - they may be all you have - we took a long rest before completing the traverse back to the Mary Green Glacier and camp at Holden Pass. Pretty soon, though, we had to get going. Up and down we traversed between the cliffs below the Company Glacier and above on the Company Headwall. Beyond there, it was up and around a few shoulders before finishing it all off with a final descent and climb back to camp. 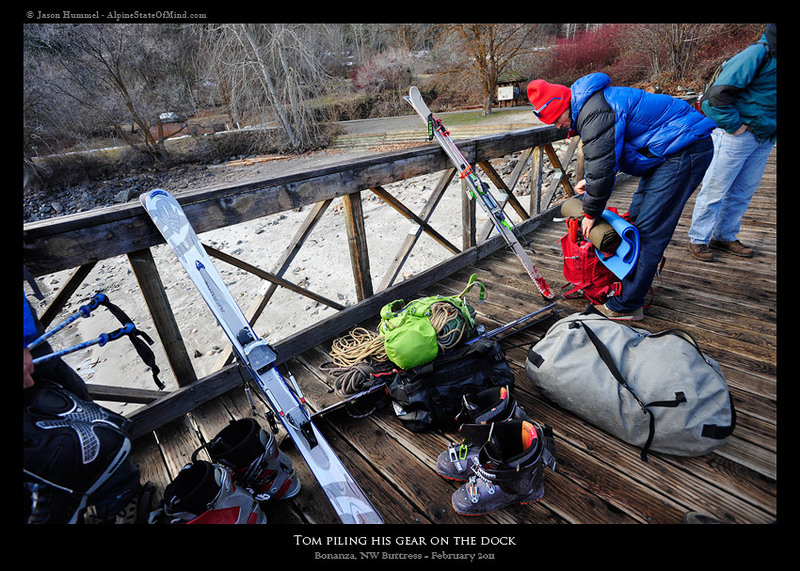 At our cave my skis, pack and camera all came off. Light still shone above the far away hills, but was beginning to turn dark blue and pink. What a great day! Sometimes you get lucky and you get what you want, just the way you want it. This was a fine example of that. 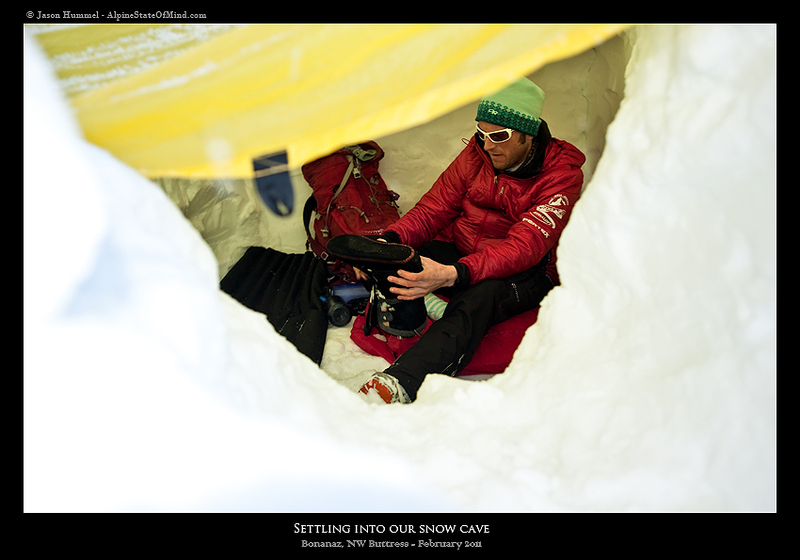 The light peeking into our snow cave was shrugged off by pulling the sleeping bags over our eyes. 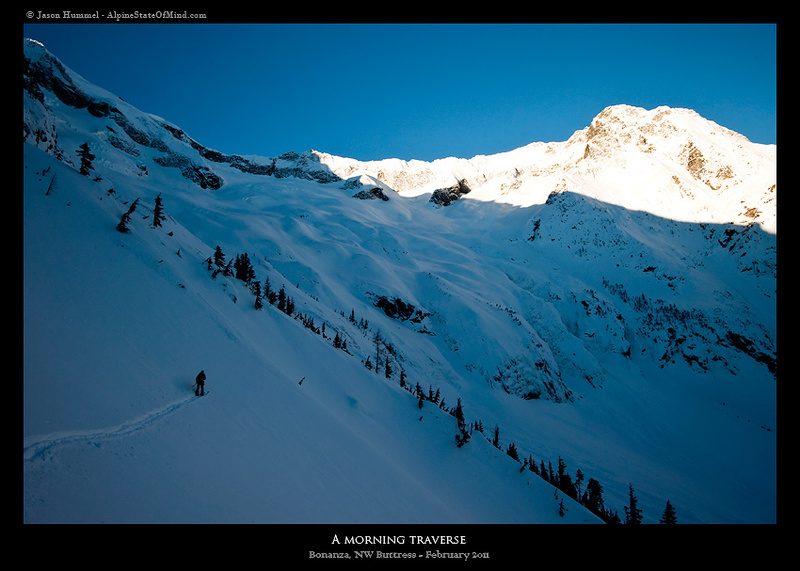 Without an early start, we'd not beat the sun before it turned the sun-exposed slopes to glop. We'd talked about Martin Peak the day before, but it wasn't going to happen unless we got an early start, which didn't happen. Instead I toured up a nearby ridge while Forest hung around camp. 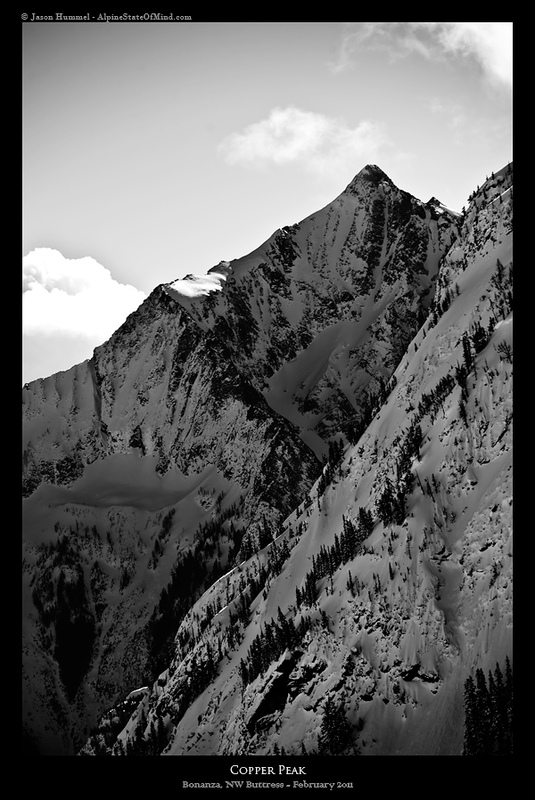 My skins swished up amazing powder to its highest point where I was greeted with views of dozens of peaks. Each one was an excuse to come back. The turns back down to camp would get my blood boiling; they were incredible! After packing camp we returned to Holden Village and spent the rest of the day, night and following morning mingling with the locals. The atmosphere was wonderful. 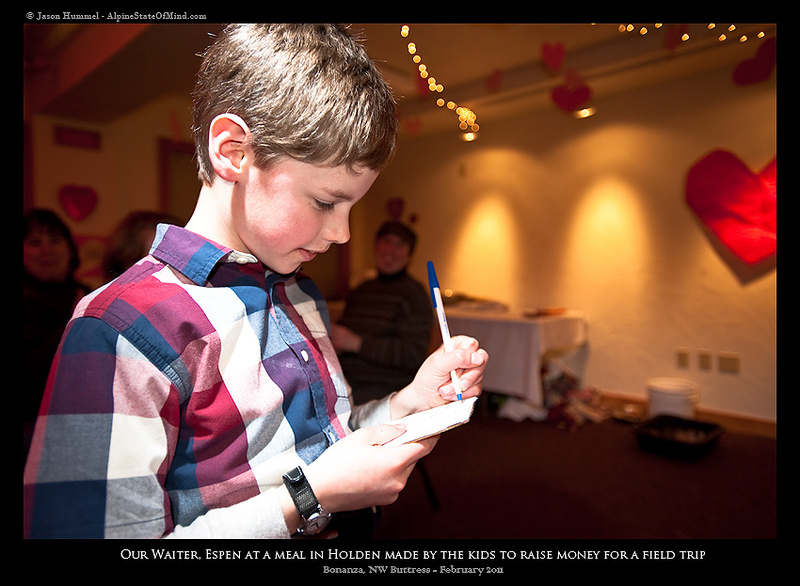 We were invited to a dinner put on by the local kids to raise funds for their upcoming field trip. Participants dressed up in costumes and everyone had a blast, including Forest and I, the outsiders. The next morning, a thought of Monika and her fate hadn't occurred to me yet. This changes during a breakfast prayer and speech put on every morning. The woman says some final words to everyone present. She reads into the microphone a poem, "How to be a person". Of it all, she dedicates it (teary-eyed) to her old neighbor, Monika Johnson!!! Amazing what ripples there are. I've always imagined a person’s death to be like an explosion. Those that are closest to the one who died, who are affected the most, carry the best parts of her with them, like shrapnel. They are reminded of who that person was and they emulate those characteristics that they loved the most. In the end, each affected person walks around with a part of that individual. Unknown to me Monika had spent much time in Holden volunteering. Perhaps the shrapnel I carry with me will be a growing desire to return to Holden one day and volunteer my own time there. With most of the residents waving goodbye, a few dozen people who were leaving town, waved back. 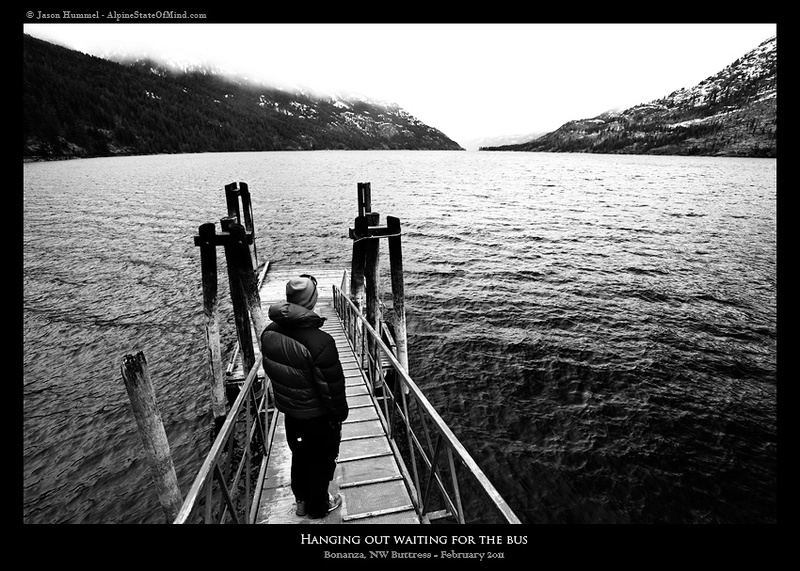 A bus was taking us to the dock where the Lady of the Lake would take us back to Field's Point. A 4 hour drive in our own vehicles will then take us all the way back home. Meanwhile this trip ended for me on the shores of Lake Chelan, just after the bus departed back to Holden. Staring up at the mountains, I realized they had re-energized me. I'm like a solar battery that needs charging and high mountains have the strongest rays. For awhile I have to return to the lowlands, but I'll always be back to visit high places such as Bonanza.